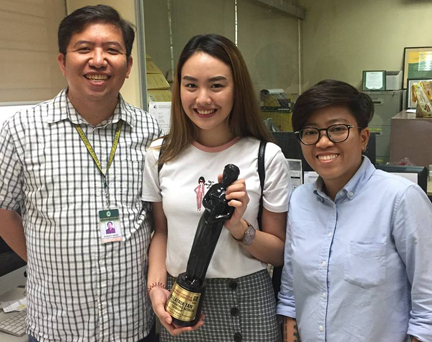 Two student projects from Far Eastern University recently brought home Urduja Film Festival trophies during the 5th UFF awards night at Sison Auditorium in Lingayen, Pangasinan. Madison, directed by Jesus Singh, won the Best Sound and Musical Score award for Jeff Hernandez while Estrella, helmed by April Jelen Tan, bagged Best Supporting Actress for Bellatrix Tan, who plays the elder sister in the short film. Both competed with 21 other finalists in the UFF short film competition. Madison is a musical short film about a transgender student (Christian Viñas) who is fond of making fun of other people. One day, the lead character belittles an old woman (Raven Relavo) who is asking for help. Then, mysterious things start to happen. Meanwhile, Estrella tells the story of Angel (Larissa Alivio), an aspiring actress who finds it difficult to penetrate the entertainment industry due to a strange condition. Compounding her problem is that elder sister Jackie usually gets chosen for projects because of her mestiza looks. Singh and Tan have since graduated from FEU. Both films were completed as part of their final requirement for the Cinema Production (CNM2) class. Singh was assisted by fellow FEU Theater Guild members and alumni led by Viñas, Relavo, assistant director Anne Valencia, directors of photography Richmond Cadsawan and Kenneth Mandrilla, FEU Cheerdancers, and Nota Productions team members Bevelyn Lopez, John Jeff Clores, Franz Dollete, Mhyca Ramos, Nolan Marcojos, Renz Regis, Jason Carpo, Bernice Punay, Kristal Lascano and Ashley Relleve. Tan, on the other hand, got the support of fellow Peekaboo Productions team members—assistant director Maria Fatima Francisco, scriptwriter and production designer Sandra Jade Villa, production manager Geneva Paula Mae Espejo, director of photography and colorist Sherwin Frondozo, and production designer, editor and sound designer Natalie Dones. UFF is an annual event which focuses on student and independent films, both short and feature-length projects that promote and preserve the country’s cultural and heritage values. The Pangasinan-based competition is mainly sponsored by the National Commission for Culture and the Arts and supported by the Film Development Council of the Philippines and the Movie and Television Review and Classification Board.